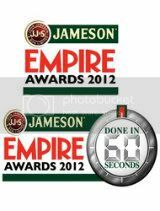 Stars of the film world gathered on March 25 to celebrate the Jameson Empire Awards 2012 and to witness what has been an outstanding success for British film and British acting talent. “Tinker Tailor Soldier Spy” dominated the awards, winning Best Thriller, Best British Film and Best Actor for Gary Oldman; closely followed by “Harry Potter And The Deathly Hallows – Part 2,” which was awarded Best Director for David Yates and Best Film. The night also saw Kenneth Branagh’s “Thor” win Best Sci-Fi, Ben Palmer’s “The Inbetweeners” win Best Comedy and Ben Wheatley’s “Kill List” win Best Horror. Further to Gary Oldman’s deserving win, British actors continued to lead the awards with Olivia Colman winning Best Actress for her role in Paddy Considine’s “Tyrannosaur,” Michael Fassbender won the Empire Hero award and two of Britain’s rising stars won Best Newcomer: Tom Hiddleston for “Thor” and Felicity Jones for “Like Crazy.” Tim Burton was honoured with the Empire Legend award. “The Adventures Of Tintin: The Secret Of The Unicorn” won The Art of 3D award and Ron Howard was honoured with the Empire Inspiration award.